BACKTIME: Savannah To Clemson: Drive Or Fly? 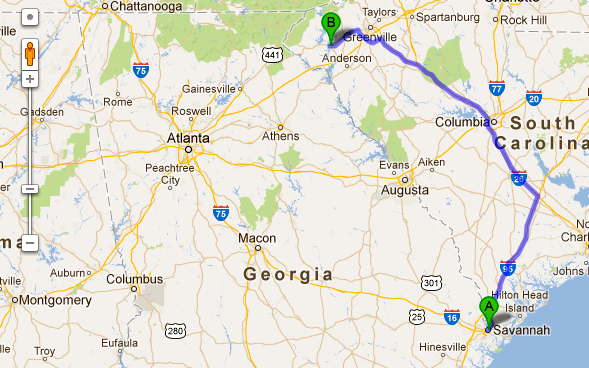 Clemson SC is a 4 hour and 15 minute drive from home. It is a tedious and boring drive, but it isn’t all that long in the scheme of things. But today I opted for a different plan. I flew to Atlanta and drove 2 hours to Clemson from there. That doesn’t make much sense does it? Well here are the factors in making that call, a choice I’ve been making more and more lately. Primarily it’s necessary for preparation. In my brief time between events, I often have the kids. I also have workouts to catch up on, and many TV shows to digest from the DVR. Add these past couple of weeks of surveying potential new SUVs, and you’re right up against it until it’s time to leave. While the time at Savannah airport or on the plane isn’t plentiful, it is a chance to hit the books. There is no work you can get done in the car besides making phone calls. The second and less important reason is every segment counts. It’s usually a motto I don’t employ until November/December, but why wait? Get to Platinum Medallion a little earlier and you don't have to make such hard choices. Driving is for going home after the game when I’m all keyed-up on adrenaline and 5-Hour Energy, but alas I have to go from Clemson to Columbia, Missouri for a Saturday game. So it’s going to be a 2-hour drive back to Atlanta, a flight to St. Louis, and then a 90-minute drive to Mizzou. Then a 90-minute drive back before two flights home. It’s like the worst of both worlds: The hard choices are the price for having made such a good career choice.